The Arts Center of Coastal Carolina has been a mainstay for the arts here since 1996; however, the Arts Center has experienced financial difficulty and has appealed to the Town of Hilton Head Island for assistance. 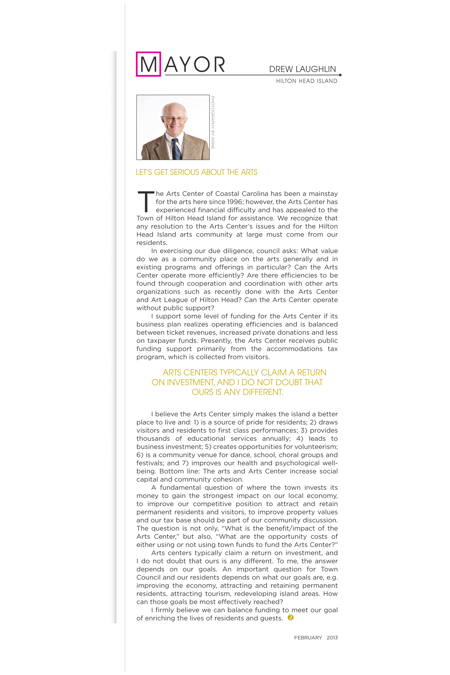 We recognize that any resolution to the Arts Center’s issues and for the Hilton Head Island arts community at large must come from our residents. In exercising our due diligence, council asks: What value do we as a community place on the arts generally and in existing programs and offerings in particular? Can the Arts Center operate more efficiently? Are there efficiencies to be found through cooperation and coordination with other arts organizations such as recently done with the Arts Center and Art League of Hilton Head? Can the Arts Center operate without public support? I support some level of funding for the Arts Center if its business plan realizes operating efficiencies and is balanced between ticket revenues, increased private donations and less on taxpayer funds. Presently, the Arts Center receives public funding support primarily from the accommodations tax program, which is collected from visitors. 7) improves our health and psychological well-being. Bottom line: The arts and Arts Center increase social capital and community cohesion. Arts centers typically claim a return on investment, and I do not doubt that ours is any different. To me, the answer depends on our goals. An important question for Town Council and our residents depends on what our goals are, e.g. improving the economy, attracting and retaining permanent residents, attracting tourism, redeveloping island areas. How can those goals be most effectively reached? I firmly believe we can balance funding to meet our goal of enriching the lives of residents and guests. 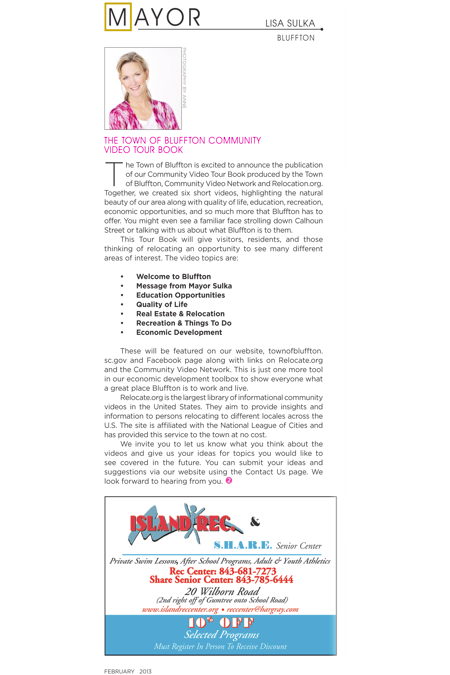 The Town of Bluffton is excited to announce the publication of our Community Video Tour Book produced by the Town of Bluffton, Community Video Network and Relocation.org. Together, we created six short videos, highlighting the natural beauty of our area along with quality of life, education, recreation, economic opportunities, and so much more that Bluffton has to offer. You might even see a familiar face strolling down Calhoun Street or talking with us about what Bluffton is to them. These will be featured on our website, townofbluffton.sc.gov and Facebook page along with links on Relocate.org and the Community Video Network. This is just one more tool in our economic development toolbox to show everyone what a great place Bluffton is to work and live. Relocate.org is the largest library of informational community videos in the United States. They aim to provide insights and information to persons relocating to different locales across the U.S. The site is affiliated with the National League of Cities and has provided this service to the town at no cost.